Horseweed is a native North American annual plant with stiff, erect, branched and leafy stems, 1-7 feet tall. The grooved, bristly, and hairy stem bears alternate, entire or serrate leaves that are oblanceo-late and petioled near the bottom of the plant, narrow and sessile near the top. Numerous tiny (to 1/4 inch), green and white flower heads appear in panicled terminal clusters from June to November. Each flower head has many greenish white ray florets which do not spread and many yellow disk florets. Found in North and South America and Europe. Generally inhabits waste places, roadsides, fields, and meadows all over North America except the extreme northern parts. 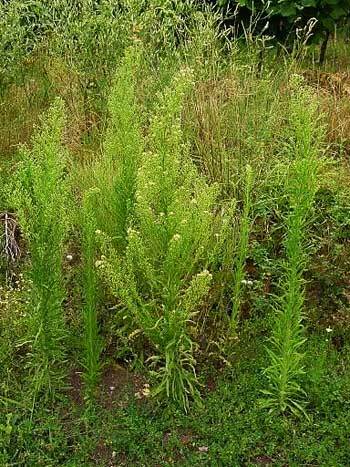 Horseweed is particularly suitable for diarrhea, dysentery, internal hemorrhage, and hemorrhoids. Native Americans boiled the root to make a tea for menstrual irregularities. It has also been recommended for bladder problems and rheumatism. Excellent for cholera, colon trouble, and summer complaint. Good for tuberculosis, kidney gravel, diabetes, hemorrhages of the stomach, nosebleeds, fevers, bronchitis, coughs, cystitis, and dropsy. Africans used it for eczema and ringworm. The whole plant in flower, dried in bunches. Infusion: steep 1 level tsp. leaves or plant in 1 cup water for 30 minutes. Take 1-2 cups a day. Enema: steep 1 tsp. leaves or plant in 1 qt. boiling water for 20 minutes. Use hot (110-112 degrees F.).